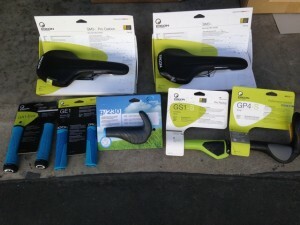 Long-time CORBA supporter Ergon has again come through with a generous donation of their popular grips and saddles. These items will be used as rewards for volunteers who participate in CORBA trail work events (click here for more details), as well as other events. This latest Ergon donation includes more than 30 items, such as ergonomic grip/bar-end combination grips, as well as more conventional padded grips, and ergonomic saddles which can be used for both road or mountain bike riding. This entry was posted on Friday, March 28th, 2014 at 6:51 pm and is filed under Advocacy, Trail Crew. You can follow any responses to this entry through the RSS 2.0 feed. You can leave a response, or trackback from your own site.